Raeyn August 21, 2017 August 21, 2017 No Comments on No Sun For You! As I am writing this, parts of the United Kingdom are able to catch a very teensy partial eclipse off of the one that just crossed the United States. 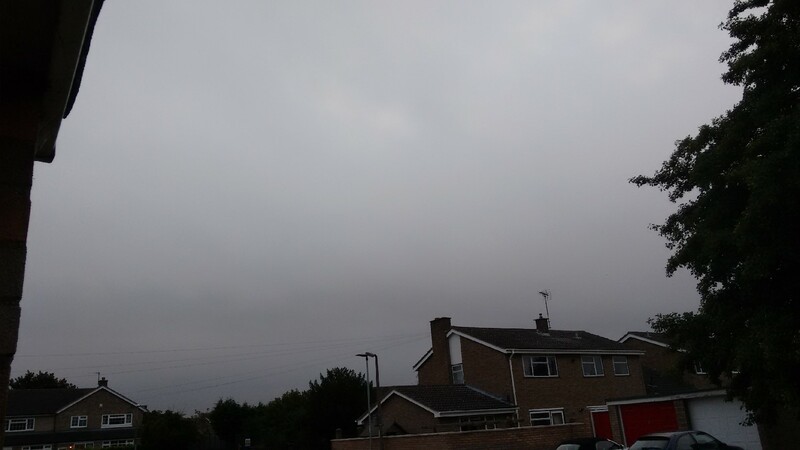 So, of course, we have total cloud coverage, ha ha. Z reminded me that we *did* get a 90%-er a few years ago that I’d miscategorised in my brain as a lunar eclipse, so that made it a bit better. That, and we’ve had the NASA stream up, so I just got to see the eclipse half a dozen times as it crossed the United States. It’s been pretty awesome, and it reminds me that I’m still just as determined to see a full solar eclipse as soon as possible. I know there’s one in the States in 2024, but there’s one in 2026 in Portugal, and one in 2027 in Spain, so those are the ones I’ve got flagged up on my bucket list agenda. Smallhausen is finally getting a sleepover with her grandparents, so Littler has been chilling with us watching eclipses. And out of nowhere, she seems to be covered in hives… grand. Neither Z nor myself have any food allergies that we know of in our families, but neither of us clocked the hives *before* dinner. It’s stuff she’s had before — Rogan Josh curry from a mix we buy regularly, rice, and chicken. Z thinks they might have changed the formula slightly and that could be the cause of the problem. She’s not fussed in the slightest by it, so Z took some pictures for a starting point, and we’ll see about getting further guidance tomorrow as and when needed… poor Boops. Z further thinks it’s possible that it’s like his hayfever, which mutated to asthma, which mutated to not being able to be around white wine, to now not being able to be near pretty much anything alcohol-based. But eh, that’s for tomorrow. For today, I can pat myself on the back for getting part of a chore I’ve been meaning to get done forever sorted. 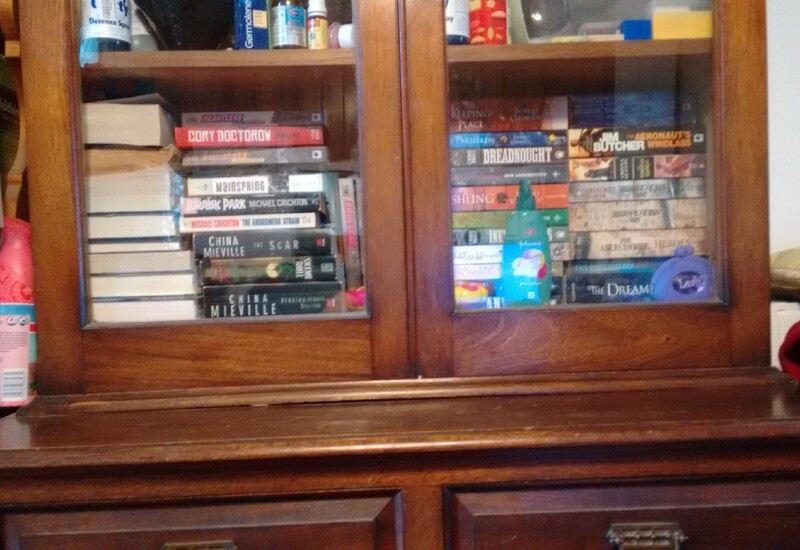 I ran out of bookshelf space ages ago, and had been stashing books in the cupboard under the glass case behind me. I wanted to tidy out the glass case so that I could put my books there — because books shouldn’t be locked in the dark, the poor darlings. I’m probably going to have to fiddle with it for optimum spacing, which might mean the spines of the books not being visible. We’ll see. It feels wrong if you can’t see the books, but eh. I’ll figure out the right balance once it becomes more relevant//the rest of the shelves are cleared off. For now, I am going to grab a cool beverage, pick up my knitting, and watch Game of Thrones. Woo, party, etc.